FOTC materials, including the agenda, speaker presentations, session summaries, and videos, are available on our website. Release from the AAP: In an effort to educate the public about the importance of sustained funding and support for pediatric research, the American Academy of Pediatrics (AAP) has developed Seven Great Achievements in Pediatric Research. This campaign highlights seven groundbreaking therapies and technologies developed through research made possible by federal investments. The American Board of Pediatrics recently co-sponsored the Forum on Organizational Quality Improvement, along with The Multi-Specialty Portfolio Approval Program and the American Board of Medical Specialties. The event was held May 13, 2015, in Rosemont, IL, and showcased initiatives within the ABMS Maintenance of Certification (MOC) Multi-Specialty Portfolio Approval Program. This particular pathway allows physicians to submit QI projects through their institutions for MOC credit approval. Discussions centered around leadership concepts, best practices by Portfolio Program sponsors, and successes and obstacles faced by participants. Because the use of quality improvement (QI) methods and safety principles can improve child health outcomes and reduce harm, more training programs must be developed, along with more academic recognition and promotion for successful QI activities, according to a commentary published in the June 2015 issue of Pediatrics. More than 75 experts in testing and medical education will gather in Durham, N.C., May 15-16, to explore new ways to measure the knowledge, learning and competency of pediatricians. 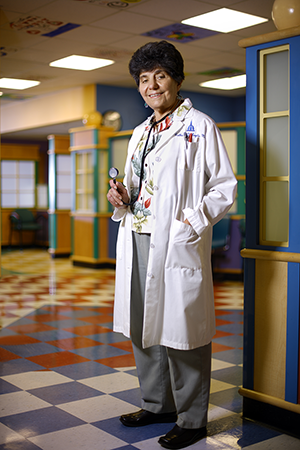 Although Dr. Catherine D. DeAngelis has a permanent certificate in General Pediatrics, she chose to maintain her certification throughout her clinical career and beyond. She continued to recertify while serving as editor-in-chief of JAMA. The American Board of Pediatrics (ABP), along with the American Board of Pediatrics Foundation, has named David G. Nichols, MD, MBA as its new President and CEO, succeeding James A. Stockman III, MD.